The Metedeconk Preserve contains 79 acres of hardwood swamp and floodplain forest characteristic of the northern Pine Barrens. It is a wonderful location for a relaxing walk, and a chance to see these habitat types up close. Scenic views of the Metedeconk River prompted the winding path through the preserve to be named the Silver Stream Trail. The name was chosen by a Jackson Township fourth grade class in a contest held in the fall of 2007. The two-mile trail is wide and flat and meanders through various forest types before closely following the Metedeconk River for about ¼ mile. 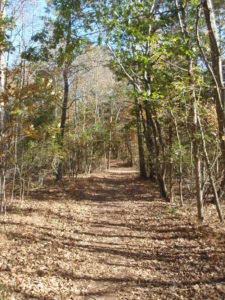 The trail is wide and flat, and is fairly easy walking. Some portions of the trail pass over raised boardwalks that enable hikers to get very close to the floodplain and riparian wetlands. At intervals along the trail, there are interpretive signs with information about various plants and animals that walkers might see along the way. The Metedeconk Preserve is located close to the headwaters of the Metedeconk River. Protected floodplains and wetlands in proximity to rivers and streams are vitally important for holding stormwater and prevent downstream flooding. This floodwater storage capacity becomes even more vital as adjacent areas become more developed. Try to walk this trail after a major storm event, and you will see just how much water these areas can hold – even the raised boardwalk may be under a foot or more of water! The preserve is managed primarily by the Jackson Pathfinders, a local group of volunteers who work to support land preservation and build trail systems to encourage public use of protected lands. The Jackson Pathfinders are largely responsible for the construction and maintenance of the Silver Stream Trail.